Info "A man needs saving here, cloud!" Saving Rain is a downloadable microgame in WarioWare: D.I.Y. and WarioWare: D.I.Y. Showcase. It was released on September 16, 2009 in Japan, August 16, 2010 in North America, and September 17, 2010 in Europe. 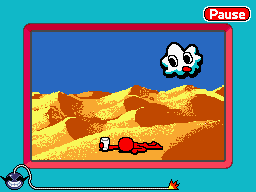 At the start of the game, a stick figure is exhausted in a desert-like setting and there is a nearby cloud floating around randomly. The player needs to tap the cloud eight times to get it to rain. This page was last edited on October 9, 2018, at 20:52.